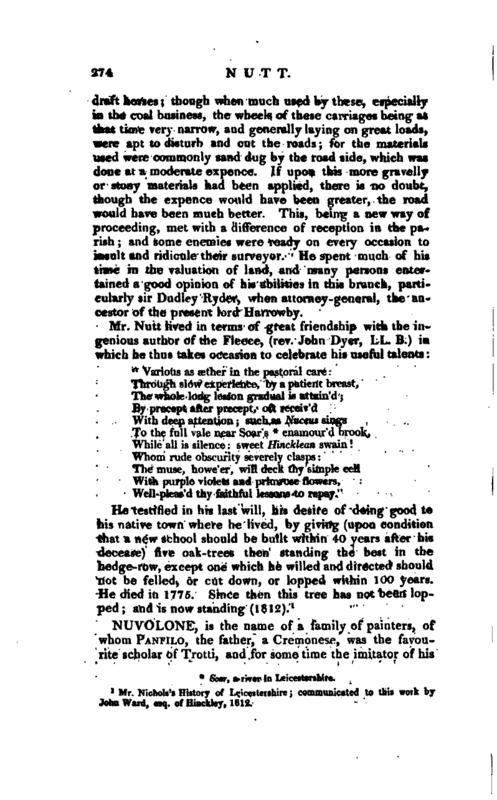 , a very ingenious man, was the son of Robert and Sarah Nutt, and born at Hinckley in September 1700. He was educated at the free grammar-school in that town, where he made a very considerable progress in learning; and at a proper age, was put apprentice to Mr. John Parr of Hinckley, an eminent apothecary; in, which station, by his diligence and industry, he gained great confidence and respect from his master and the whole family. After this, he attended the hospitals in London; and on his return to Hinckley, carried on for many years a considerable business with reputation and success. Some time about the middle of life he was chosen one of the surveyors of the highways for the parish, when he adopted a new method for improving the same, by turning over the roads the water that came from the town; which being considerably enriched by washing the streets and public sinks, what he could spare from the roads, or rather after it had done the business there, he conveyed upon the lands of those who approved of his proceedings. The consequence was, the land was greatly enriched. 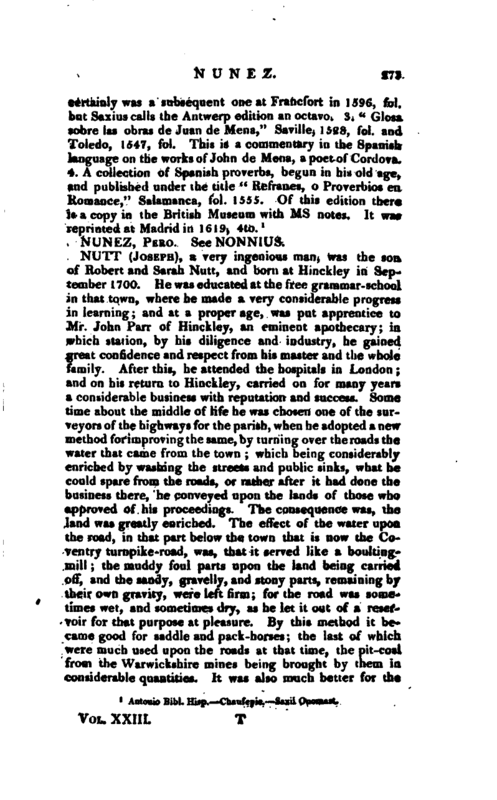 The effect of the water upon the road, in that part below the town that is now the Coventry turnpike-road, was, that it served like a boultingmill; the muddy foul parts upon the land being carried off, and the sandy, gravelly, and stony parts, remaining by their own gravity, were left firm; for the. road was sometimes wet, and sometimes dry, as he let it out of a reservoir for that purpose at pleasure. By this method it became good for saddle and pack-horses; the last of which were much used upon the roads at that time, the pit-coal from the Warwickshire mines being brought by them in considerable quantities. It was also much better for the | draft horses; though when much used by these, especially in the coal business, the wheels of these carriages being at that time very narrow, and generally laying on great loads, were apt to disturb and cut the roads; for the materials used were commonly sand dug by the road side, which was done at a moderate expence. If upon this more gravelly or stony materials had been applied, there is no doubt, though the expence would have been greater, the road would have been much better. This, being a new way of proceeding, met with a difference of reception in the parish; and some enemies were ready on every occasion to insult and ridicule their surveyor. He spent much of his time in the valuation of land, and many persons entertained a good opinion of his abilities in this branch, particularly sir Dudley Ryder, when attorney-general, the ancestor of the present lord Harrowby. Soar, a river in Leicestershire. Well-pleas’d thy faithful lessons to repay." Mr. Nichols’s History of Leicestershire; communicated to this work by John Ward, esq. of Hinckley, 1812.